Andrea and Derek were married in June of last year. Jordan said that no detail of this event went untouched, and she was right. But after looking through the photos, and watching their wedding video, and reading their responses to the questionnaire that Jordan has all her couples fill out, it’s not the details that jumped out at me. It wasn’t the donut wall (although who doesn’t love that!) or the beautiful flowers, or even Andrea’s stunning dress. What stuck out to me, immediately, were the words. The words that Andrea and Derek wrote to each other in letters exchanged before the ceremony…the wording of their invitations (which were beautifully done by Erin Hague) that echoed that of Andrea’s parents’ own invitations from 34 years ago. The heartfelt words spoken by the minister during the ceremony, and the bridal party at the reception…and the most important words, the ones that Andrea and Derek will live by for the rest of their lives: their vows to one another. I don’t know this couple; I’ve never met them. And yet, after writing about this wedding, I can tell you that this is the real deal. 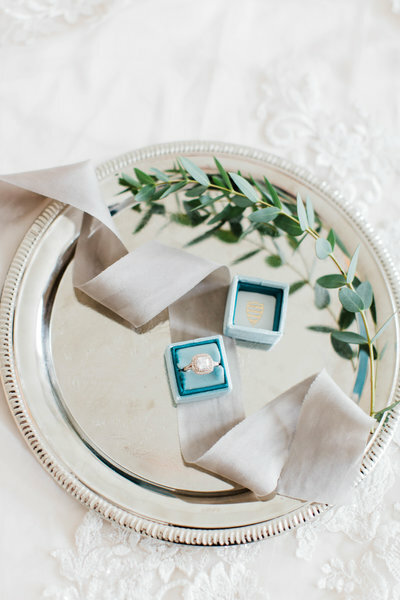 As important as it is to have a beautiful ceremony and an unforgettable reception, the love between a couple is what will make their relationship stand the test of time. And there is so much love here- love for one another, love for their friends and family, and love for God. This love is expressed so perfectly, with words. But let me back up a little! school, but [he] couldn’t quite convince her to date me. But it’s clear that God has his perfect timing.” After high school they both went their separate ways, Andrea to nursing school and Derek to become a fireman. But they often reconnected back in their hometown, and Andrea couldn’t shake the nagging feeling that Derek could be more than a friend. She finally decided to text him, and she says that there isn’t a day that’s gone by since that day in June where they haven’t spoken. After their first date she knew she had met the man she was going to marry, and she was right. For their wedding, Andrea envisioned a romantic garden ceremony (despite the fact that Derek kept reminding her that they can’t predict the weather). 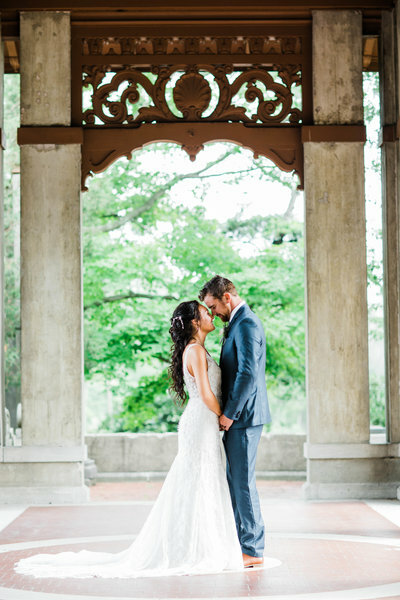 When she saw the Klehm Arboretum she knew instantly it would be the perfect venue. Step it Up Rental contributed all the equipment they would need to turn this venue into the perfect spot for a wedding and reception. 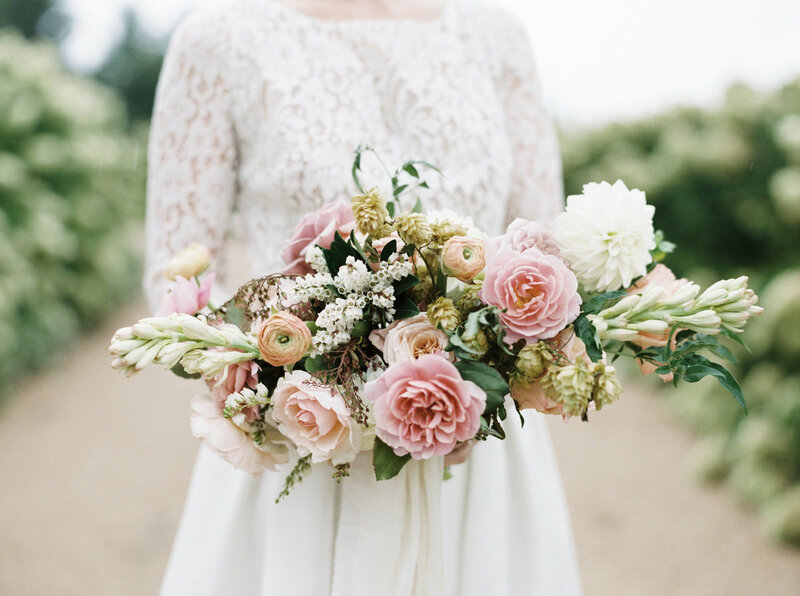 In addition to a wedding filled with flowers and nature, Andrea knew she wanted to incorporate the color peach, because it was Derek’s last name (and soon to be hers!). 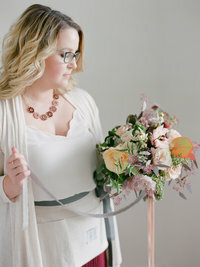 She chose peach flowers from Wild Orchid Custom Florals and accented them with colors of gold and slate blue. The couple decided to splurge a little on florals to really accomplish that whimsical garden theme they were going for. They had stunning floral hoop over the dance floor, and Andrea said the flowers turned out to be everything she wanted and more. Their cake came from Greenfire in Rockford, and it was a naked cake filled with toffee and caramel. Not only did it taste great, it looked beautiful and it complimented the decor perfectly. The bakery added some blue icing dripping down the side, and they accented the cake (and their last name!) with some loose peaches around the bottom. The newlyweds cut their cake with utensils passed down from Derek’s grandparents. In addition to the cake, the couple had a custom-made (by Derek) donut wall at their reception! Derek designed and built it all himself, and it was definitely a crowd-pleaser. In lieu of favors, the bride and groom chose to make donations to a few charitable organizations that were meaningful to them: The Parkinson’s Foundation, and the American Cancer Society. They said that by making these donations, they felt they were both honoring the family that they lost and also including them in their special day. Derek wore a blue suit from Men’s Warehouse with a black bow tie and brown shoes, and his groomsmen did as well. 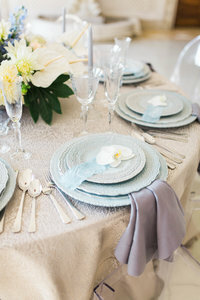 Andrea’s bridesmaids wore gorgeous, tea-length, lace, slate-blue dresses. It’s not often that brides choose tea-length gowns for their bridal party, and this unique choice worked perfectly with their color scheme and venue. Andrea originally found her gown online, and when she went to try it on she immediately knew it was the one. It was a form fitting, crepe bottom gown with a beautiful long train, an open back and an illusion bodice. Her hair and makeup was done by Hannah Elisabeth Beauty. Music from Elegant Ensembles accompanied Andrea as she walked down the aisle in trail of white petals with fountains spraying in the background. The music set the tone for the ceremony perfectly. Derek said his favorite moment of the day was watching Andrea walk towards him in her stunning white dress, and it’s easy to see why. The reception was full of donuts and dancing, and Andrea fondly remembers the epic dance train that grew and grew until all the guests were parading up and down the venue, with a brief stop at the donut wall. An inflatable, dancing dinosaur even made an appearance…it doesn’t get much more entertaining than that! Both Andrea and Derek remember the day as full of fun, and also full of love. Their hearts were full as their families came together, and they look forward to continuing on the legacy of everlasting friendship, marriage, and family that was modeled for them by their parents and grandparents. When asked what advice they have for future engaged couples, Andrea said without a doubt to hire a wedding planner, and not just any planner! Jordan from Ever After Planning. It seems to be a trend that couples look back and see the money they spent on a planner as the best investment they could have made for their big day (I know I did!) Jordan went above and beyond to manage stress, offer advice, share creative insights, and overall make sure the day was executed perfectly. Andrea and Derek look forward to carrying these memories with them forever, and to one day sharing them with their children and grandchildren. They said at the end of the day, it was a perfect day, because they got to marry each other. Andrea and Derek, thanks for including Ever After Planning in your special day. We hope you live happily…ever after. Andrea + Derek from This Charming Heart on Vimeo. Want to see more of Andrea and Derek’s special day? Check out their full gallery on our website!